Screw-on tee nuts are ideal for mating machine threaded components with wood parts. The screw-on flange provides a positive lock against rotation and ensures that tee nuts won't drop out with use, making them the preferred method for installing threaded furniture levelers and glides. These fasteners were just as described. They were perfect for reattaching our bedpost to our bed. I have used regular T-Nuts in the past and have had trouble with them spinning in the wood causing a real problem. With the screws holding these T-Nuts they really work well. Iwill use these in the future exclusively. They are as good as advertised, were just what i needed. Traditional T-nuts with prongs can come loose after repeated assembly/disassembly of parts. The prongs can also split wood during initial installation. These screw-on T-nuts avoid both problems. Also, for all but the most heavy duty applications, they can be installed on the front side of the part, rather than the back. 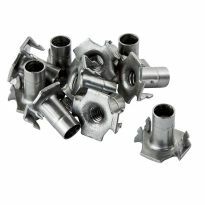 This allows addition of T-nuts that were not included in original construction design without the hassle of threaded inserts, which are more elegant but also more difficult to install. Fast and exactly what I expected. I needed a replacement piece to reattach a spindle to our bed. I searched all of the usual places...even the local hardware stores and big boxes...to no avail. Enter Rockler! The right part with the right spec and sturdy to boot. Ordered...received...installed...and enjoyed. I repaired a small desk from Bombay that had wiggly legs because the fittings were a soft brass. Replacing with thses was easy and did the trick. These guys went above and far beyond typical customer service on a very small order. I highly recommend them. I Like these screw on tee nuts very much. I use the 3/8th size my only complaint and one I have heard from people I have recommended them to is they don't come in a half inch size. Worked out great for mounting the legs on two DIY projects, a sofa and chair. Very easy to install and feels very sturdy. I used a 1 3/8" Forstner bit to counterbore and have the legs mount flush with the frame. Used these to mount legs on my DIY sofa project. I used a 1 3/8" Forstner bit for the counterbore. Great product but expensive...shipping cost does not help. Very happy. Actually stayed in place. After trying every tee-nut I could find in stores, with no success, these worked perfect for me. This product is versatile in that I used them to secure my wood Drill Press Table to the Press table in an upside down manner and they do not pull out as the mfg. system frequently does. I would recommend this product to everyone for it is strong, versatile in many applications, and cost effective. It was so easy to install and use! My table legs are now very sturdy and I didn't have to worry about accidentally putting them in even slightly crooked. Will definitely be getting more for any future needs. Awesome part to replace the cheap pot metal nuts used on our kitchen chairs. Great way to save a couch. The product was excellent as it fit perfectly into the area of the old t-bolts. The original product was pot metal and these steel plates are much stronger. Perfect for the table I built. These are simply the best! They are superior to any like product at Lowe's or Home Depot. They are strong and well made. Will easily hold the legs of a foot stool, which is what I bought them for. Easy to use and attach. Screw on tee nuts. Easy to install. I just wish shipping would have been faster. These "Insert Nut Screws" 3/8 inch, 16 TPI, replaced insert ("T) nut screws (made of cheap "pot" metal) that literally disintegrated in our ten year old wood dining table. The screws were in the table of our dining table (vs. the table leg which screwed into the Insert Nut Screw). I looked a long time online for a replacement.and the Rockler Altamonte Springs, Florida store was of great assistance. Specifically, I want to thank Jen for the super customer service she gave me over the phone. Thank you so much for having such a diverse product line! Insert Nut Screw 3/8 inch, 16 TPI, installed under table top. Easy to install and work well. I needed to attach longer legs to a bed frame so we would have some storage underneath. 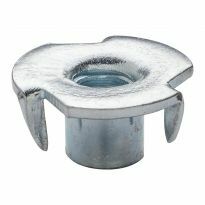 These tee nuts were sturdy and easy to install and they held the legs securely to the base. Worked great! exactly what I needed. great communication, and shipped timely. This is very good product, for which I was looking for a long time. The Tee Nuts are very well built and easy to install. I used them several times in my products. I will highly recommend this hardware. These are the best T-Nuts that I've ever used. Very heavy duty. We purchased a 4 poster bed for a guest bedroom. On arrival, I found that one of the Tee-nuts was stripped out. I had been searching locally (woodworking shops) as well as the internet and nothing fit inside the lower post as the original one had. Finally found these. They are a perfect fit AND much better quality than original parts used. I have enough to replace all other Tee-nuts on bed and have extras for other projects. From now on, I will check here first for anything I might need for woodworking. Shipping was quicker than had been indicated. Will highly recommend. Excellent for the job at hand. As I needed a thread that would hold up to repeated use, I chose these screw on threads over ones that had tabs for anchors. Nice quality and perfect for removable table legs. We had a mounting plate like this break in half. This fit in the original holes and is very strong. I did some extra work and used longer screws but what I really needed was the fitting and this was exactly what I needed. These t-nuts are much stronger than any I've found at local hardware stores. 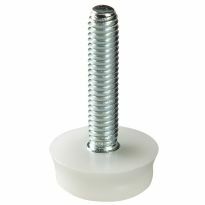 They are good for replacing chair casters and for remounting legs on furniture. Easy to install. Superb product for use with the leveling feet mentioned in other reviews. Highly recommended. They worked perfectly. Strong a good item. I use to make a curtain canopy box, I put a screw in both sides to keep the tube where the curtain is holding in place. Rockler has done it once more. This is a great product. 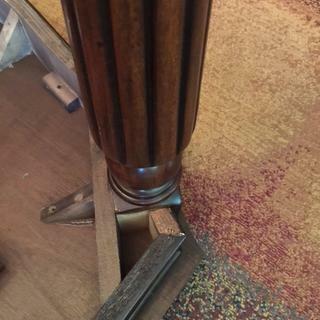 I needed to secure bun feet to an antique table that would strengthen the table and not have the t nuts spin after installation. These worked excellently for both needs. These screw on tee nuts were perfect for this project baltic birch stage stairs for a national auditorium. I used them for attaching removable hand rails. I don't think there is anyone besides Rockler that carries the 3/8-16 size I required. Due to pull out of the original hammer in tee nuts I had used to construct portions of my granddaughter's folding benches with I had to find a stronger solution. When I saw the screw on tee nuts I knew they were it. I upsized to #8 x 1 1'4&quot; screws versus the #4 screws included for additional strength. The screw on tee nuts provide at least a factor of 10X the pull out resistance of the original tee nuts. Great product and very easy to install! I used these in cabinet leveling feet for several shop projects. I replaced the wings on my table saw with a router cabinet on the right side, and a storage cabinet on the left. These leveling feet allowed me to perfectly level my cabinet tops with their lamination so I could attach them to the saw where the wings bolted on, and make everything very flat and level. It looks like an aircraft carrier now! Look good, are good. Have used over 400 of these screw-on tee nuts on an Arkansas Children's Hospital project. Accompanying screws have gotten better. Last 300 screws didn't have a single failure (no phillips head tear out). Will continue to use Rockler as my source. Used these to attach a removable tabletop to a particle board Murphy Bed panel. They worked exactly as needed. A nice fastener. Great quality product, easy to install, works as expected/advertised. Used in conjunction with part number 24315, combination leg equalizer. Both parts fit together perfectly. Used both parts during fabrication of a (very large) Tiki bar, both parts can support a substantial weight. Would recommend and use again. Overall footprint should be larger. Different footprints for sale would be nice. Larger screws would be nice. The screw tee-nut works great with longer screws. The ones with the package is to short. Could use longer screws so don't have to buy longer screws. I bought the hammer tee nuts originally, but they pulled out when I put the load of the table on the casters I attached. I then purchased these and the screws provided with the tee nuts were not adequate for the load I had, so they pulled out as well. I used longer screws and I have not had any issues. Good product, but longer screws may be needed. I've tried the press-in T-nuts, and they work OK, but I needed something that will take a bit more punishment in an outdoor setting where the wood will get wet. The press-in T-nuts work loose in wet wood and enlarge the hole, making them less secure. These screw-on T-nuts are excellent and overcome all those issues. Plus, the screws can be driven without a pilot hole. I'm going to stock up on these and make them my standard application for whenever leveling guides are required in future projects. Great quality at a good price. I am waiting for the product to arrive. I chose this item because of the research I have done and customer reviews. I need a set of 4 inserts for a sofa that I want to change the legs on. Stability and strength were a concern, I think this product will suit my needs perfectly. you'll had the connectors I needed. I'm making dressers for our home in Maine and will use these to receive the hangar bolts on the bun feet. Could not find this particular item locally -- this is best application for my project. I have used these before and prefer them to others I have used. The screw in feature makes them very sturdy. Perfect hardware for a repair project I'm working on. These come in handy building various jigs. For making jigs - sometimes woodworking jigs are more fun and satisfying to make than the final projects. These look more secure than the hammer-in type. Useful for table leg wheel attachment. These tee nuts are stronger because you can put screws in it for a stronger hold. With these tee nuts I can put glue and 3 screws for a stronger hold. To fix my bed post . I will use these for the Rockler hold downs I bought and I have many ways to use the extras. To mount 4" casters to a 3/4" plywood base to use as a dolly in my shed. wanted these for use on project. wanted more secure and stronger connection. I could not find this hardware at any local retailer. I felt fortunate to find them online as I had no idea what they were called. Thank you! 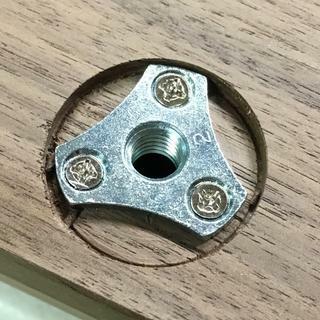 I'm going to join a desk top to its legs with these screw on tee nuts. Met the physical and structural requirements of the application. good set of tee nuts. really heavy duty. Repair a bed post that's been broken for several years, just didn't know where to go for the part. Did a Google image search and found you. I am looking for a tee nut to repair a large 4 poster bed. Where can I get this size 1 1/2 length and 3/4" thread with a base 1 3/4" with 3 screw in holes? BEST ANSWER: I have never seen a tee nut with a 3/4" bolt hole. Maybe I can offer a few workarounds. Can you epoxy a 3/4" nut into the piece? A know anyone that can tack weld a 3/4" nut to a large washer and then drill a few mounting holes for yourself? Can any Unistrut products work in your situation (try the electrical aisle at Home Depot)? That's all I got. Looking to use these and some hanger bolts to attach legs to a table top. Good application? 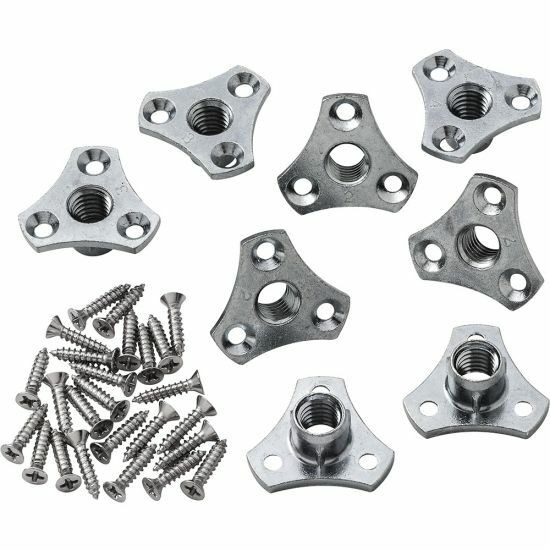 Can anyone give me the thickness of the t-nut and screws? Looking to put it into 3/4 inch lumber and not blow through the other side. what size forstner bit is needed for drilling the pilot hole for the 68379 5/16 t-nut? BEST ANSWER: The pilot hole for the 5/16" Tee Nut is 15/32". Complete instructions can be found in the "Technical Downloads" section of the product information. I need a screw on tree nut but don't know the size? It depends on the situation. 1/4-20 is a common choice for most routine uses. If unsure, go to your local hardware store and look at the various bolt sizes. That should give you an idea of which size to purchase. You can go to a big box store they have a board of screws with different sizes indicated. Any idea what the weight capacity for these nuts are? I plan on using about 10 of them on a 500lb (or so) bar that is on a bit of a slope. I've got 3/8 in bolts that are rated over 1000 lbs... just don't want the nut to be the weakest link. BEST ANSWER: The Tee nuts themselves are fine. It's going to be more a matter of what you are fastening them too. In other words, how sound is the material you are inserting them into and is the bolt entering from the same side as they are screwed into the material. If the bolt is coming from the opposite side, no problem so long as the structural integrity of the material they are in is solid. If from the same side, I would use SPAX screws with a bit more bite to screw them into the material. I don't know with any certainty but I think you'll be fine. These things are pretty robust. Will these work to connect 2 pieces of wood and change back to one as needed ? 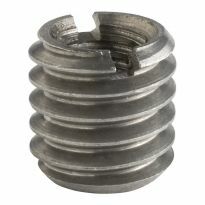 BEST ANSWER: These give you a threaded socket with limited pull-out strength. Where I used them in in mounting threaded legs to a stool. I assume this is the intended application because the threaded hole is not counter sunk. I can imagine drilling holes through a set of boards with a counter sink on the other side that would let you take off the top board if needed. This should be strong because the bolt would be pulling the fitting in, rather than out of board 1. My hope is to cut the legs off a table at about half way, and be able to easily re-attach as needed. If your legs are round that would work aesthetically. Be aware that you will either have to recess this fitting or accept a gap in the leg. In a compression situation like you describe these should work. Best of luck. Yes, you will need to bore recess holes (one on each piece of the wood you are trying to connect together) if you like the connection to be flush and use a proper size and length bolt to connect them together. The hardest process adjusting the two piece of wood so they are square with each other. Could these be mounted under a work bench for quick change of different items? BEST ANSWER: I don't see why not. The strength would be determined by the screws holding the t-nut. In need of a 1/4" screw-on tee nut for mounting to a camera tripod mount bolt. Any suggestions on where to find this? Thx. BEST ANSWER: Rockler Woodworking May have what you need. Would these work for a rock climbing wall? BEST ANSWER: They are not the expandable variety that anchors into any substrate....they are designed to be screwed into a wooden or plastic substrate...would just pull out of rock or concrete. BEST ANSWER: Looks like it would work. Base diameter of 3/8 screw on t nuts? I need four casters to put on my recliner so it will move easily. The leg that is on the chair attaches to the chair with a Center screw into the chair. The bottom of the foot, were the caster will attach is one and a quarter inch square.Do you have such casters? BEST ANSWER: That is the exact measurement of diameter, you could file off a tiny bit if the Tee Nuts show. I am looking for a tee nut to repair my daughters 4 poster bed. Where can I get an 18 pitch thread that screws 5/16" deep with 3 screw holes on the washer piece that holds it inside the footboard? BEST ANSWER: Rockler woodworking has a good assortment of screw on t-nuts. The 18 pitch is a standard pitch for a 5/16 screw.. I need something like this product in a #10 thread (hang paper towel holder in RV rather thin cabinet 5/8 thick wood) I do not remember how to call them out on a search. What specific alloy are these cast from? I am trying to calculate the failure mode and strength of the threads to see what capacity these are good until. Looking to extend the legs of a coffee table to convert it to dining table on demand... and back to coffe table...will Tee nuts and hanger bolts will resist the weight of the table and offer a strong assemble so that the legs do not wobble?